Stay safe while exercising in hot-weather by drinking enough fluids, wearing proper clothing and timing your workout to avoid extreme heat. Whether you're running, playing a pickup game of basketball or going for a power walk, take care when the temperature rises. If you exercise outdoors in hot weather, use these commonsense precautions to prevent heat-related illnesses. Exercising in hot weather puts extra stress on your body. If you don't take care when exercising in the heat, you risk serious illness. The exercise, as well as the air temperature and humidity can increase your core body temperature. To cool itself, your body sends more blood to circulate through your skin. This leaves less blood for your muscles. This increases your heart rate. If the humidity also is high, your body faces added stress because sweat doesn't readily evaporate from your skin. That pushes your body temperature higher. Heat cramps, sometimes called exercise-associated muscle cramps, are painful muscle contractions that can occur with exercise. Cramped muscles may feel firm to the touch. You may feel muscle pain or spasms. Your body temperature may be normal. Heat syncope is a feeling of lightheadedness or fainting caused by high temperatures, often occurring after standing for a long period of time, or standing quickly after sitting for a long period of time. Exercise-associated collapse is feeling lightheaded or fainting immediately after exercising. It can occur especially if you immediately stop running and stand after a race or a long run. With heat exhaustion, your body temperature rises as high as 104 F (40 C), and you may experience nausea; vomiting; weakness; headache; fainting; sweating; and cold, clammy skin. If left untreated, heat exhaustion can lead to heatstroke. Heatstroke is a life-threatening emergency condition that occurs when your body temperature is greater than 104 F (40 C). Your skin may be dry from lack of sweat, or it may be moist. You may develop confusion, irritability, headache, heart rhythm problems, dizziness, fainting, nausea, vomiting, visual problems and fatigue. You need immediate medical attention to prevent brain damage, organ failure or death. If you develop any of these symptoms, you must lower your body temperature and hydrate right away. Stop exercising immediately, and get out of the heat. If possible, have someone stay with you who can monitor your condition. Measuring core body temperature with a rectal thermometer is essential to accurately determine the degree of heat injury. An oral, ear or forehead thermometer doesn't provide an accurate temperature reading for this purpose. In cases of heatstroke, due to confusion and mental status changes, you won't be able to treat yourself, and you'll require emergency medical care. The most effective way of rapid cooling is immersion of your body in a cold- or ice-water tub. In cases of heat exhaustion, remove extra clothing or sports equipment. Make sure you are around people who can help you. If possible, fan your body or wet down your body with cool water. You may place cool, wet towels or ice packs on your neck, forehead and under your arms; spray yourself with water from a hose or shower; or sit in a tub filled with cold water. Drink fluids, such as water or a sports drink. If you don't feel better within about 20 minutes, seek emergency medical care. If you have signs of heatstroke, you'll need immediate medical help. If your core temperature is less than 104 F (40 C), but it doesn't come down quickly, you'll also need urgent medical attention. In some cases, you may need IV fluids if you cannot drink enough fluids. Get cleared by your health care provider before you return to exercise if you've had heatstroke. He or she likely will recommend that you wait to return to exercise or sports until you're not experiencing symptoms. If you've had heatstroke, you may require many weeks before you can exercise at a high level. Once your health care provider clears you for exercise, you may begin to exercise for short periods and gradually exercise for longer periods as you adjust to the heat. Pay attention to weather forecasts and heat alerts. Know what the temperature is expected to be for the duration of your planned outdoor activity. In running events, there are flag warnings that correspond to the degree of heat and humidity. For example, a yellow flag requires careful monitoring, and races are canceled in black flag conditions. If you're used to exercising indoors or in cooler weather, take it easy at first when you exercise in the heat. It can take at least one to two weeks to adapt to the heat. As your body adapts to the heat over time, gradually increase the length and intensity of your workouts. Know your fitness level. If you're unfit or new to exercise, be extra cautious when working out in the heat. Your body may have a lower tolerance to the heat. Reduce your exercise intensity and take frequent breaks. Dehydration is a key factor in heat illness. Help your body sweat and cool down by staying well-hydrated with water. Don't wait until you're thirsty to drink fluids. 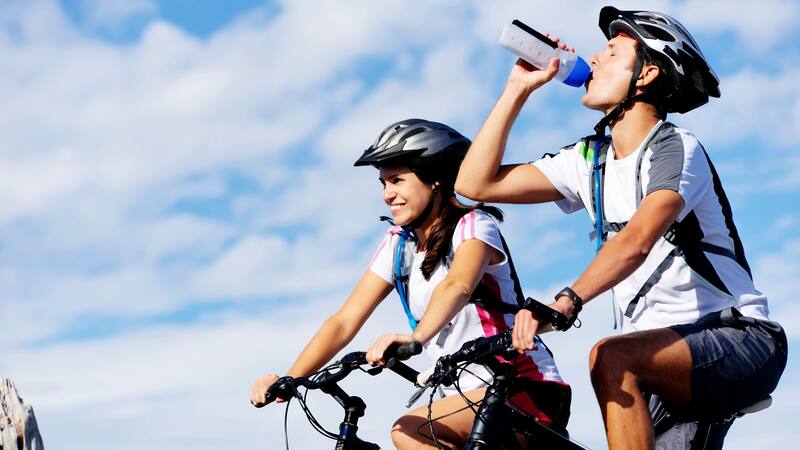 If you plan to exercise intensely, consider a sports drink instead of water. Sports drinks can replace the sodium, chloride and potassium you lose through sweating. Avoid alcoholic drinks because they can actually promote fluid loss. Lightweight, loose-fitting clothing helps sweat evaporate and keeps you cooler. Avoid dark colors can absorb heat. If possible, wear a light-colored, wide-brimmed hat. Exercise in the morning or evening, when it's likely to be cooler outdoors. If possible, exercise in shady areas or do a water workout in a pool. A sunburn decreases your body's ability to cool itself and increases the risk of skin cancer. If you're concerned about the heat or humidity, stay indoors. Work out at the gym, walk laps inside the mall or climb stairs inside an air-conditioned building. Certain medical conditions or medications can increase your risk of a heat-related illness. If you plan to exercise in the heat, talk to your health care provider about precautions. Heat-related illnesses are largely preventable. By taking some basic precautions, your exercise routine doesn't have to be sidelined when the heat is on.